The P-29 or company Model 264 was a Boeing effort to improve upon the already impressive performance of the P-26 'Peashooter'. It dispensed with the latter's drag-inducing fixed gear, struts and bracing wires. 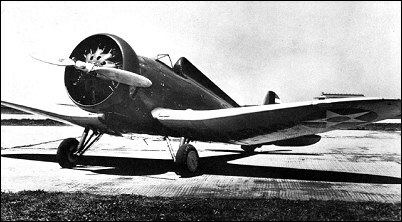 A low-set cantilever wing monoplane pursuit ship with retractable landing gear, the P-29 looked more formidable than the production P-26, and one of the three machines built attained a speed of 376km/h at 2286m with its 410kW Pratt & Whitney R-1340-35 engine. Initially flown on 20 January 1934, the first of the three airframes was originally designated XP-940 and was built with an enclosed, flush canopy, a concept apparently ahead of its time. The canopy design proved unpalatable. Boeing pilot Billy Acker asserted that it 'rattled like a bird cage'. After brief flight tests in which Army pilots also judged the canopy impracticable, this first airframe was returned to the manufacturer, rebuilt with the more traditional open cockpit, and redesignated YP-29A The second airframe, designated YP-29, added landing flaps to the basic design while the third, the YP-29B, added greater dihedral to the wings. In its various incarnations, the P-29 was an advanced fighter and received considerable attention. But flight tests confirmed that the P-29, which was heavier than the P-26, offered at best only a very marginal improvement in performance. On balance, it was deemed not to warrant further development. Though the three airframes were exhaustively tested well into the mid-1930s and contributed to institutional knowledge about fighter design, they were eventually deleted from inventory and scrapped.